So happy colder weather is here! That’s right it means it’s falconry season, the time of year we spend the rest of the year preparing for! 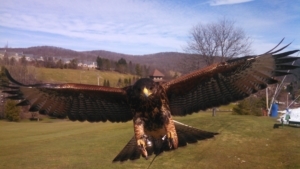 American Hawkeye’s School of falconry is open and ready to share our birds with you! Check our events page to book an experience with us. This is a great way to get outdoors and get up close and personal with live birds of prey! Our live shows will start again in the spring. We have owl encounters, night hikes and hunting trips still available for this winter. And if you’re going to be in town this summer for a corporate event spots are filling up fast book for your company today by clicking on our events button! Want to come and see us? Click below to see all of our events.